Successfully Added EDC Fingertip Gyroscope - Reduce Stress And Anxiety, Highly Portable And Durable Design (Green) to your Shopping Cart. With this EDC Fingertip Gyroscope, you will be able to magically let all your stress, anxiety and negative thoughts disappear from your mind within a split second. This cool gadget is perfect for the people among us that suffer from stress in the office or that are experiencing any other type of anxiety. Fingertip Gyroscopes such as this one are widely known to lower stress and fear levels in the human mind and are therefore often used in psychological treatments to solve issues related to OCD, ADHD, and PTSD. Additionally, this remarkable tool is simply a great gadget to have at hand for anybody out there that experiences a busy lifestyle. The calming effect of this Fingertip Gyroscope is sure to make you feel better and more relaxed – guaranteeing to leave an everlasting impression on its users. 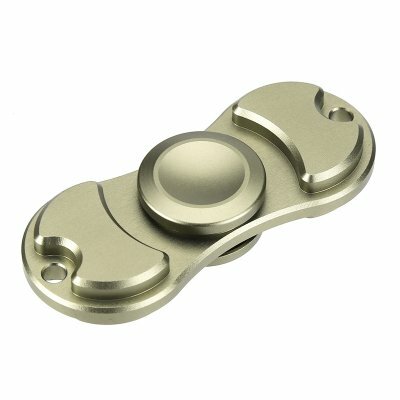 This compact fingertip Gyroscope has been made of a durable aluminum material, giving it a solid and tough feel and appearance. Its heavy blades can be spinned around effortlessly with the touch of a finger, making it easy to use for people of any age. Its miniature design furthermore makes this cool gadget highly portable thanks to which you’ll be able to carry it along wherever you go. From now on you’ll always have this amazing stress release aid at your side, ready do lower anxiety and stress levels whenever needed. Featuring a high precision mechanism, this EDC Fingertip Gyroscope is stable and can efficiently be held between your fingertips while in use. It furthermore comes with a detachable key ring that lets you attach this stress release gadget to your belt, bag, or keys – guaranteeing that it’s always at your side. The EDC Fingertip Gyroscope comes with a 12 months warranty, brought to you by the leader in electronic devices as well as wholesale electronic gadgets..
Arabic: - جيروسكوب الإصبع - Chinese Simplified: - 指尖陀螺仪 - Czech: - Konečky prstů gyroskop - Danish: - Fingerspids gyroskop - Dutch: - Vingertop gyroscoop - French: - Gyroscope du bout des doigts - German: - Fingerspitze Gyroskop - Hebrew: - גירוסקופ קצה האצבע - Hindi: - उंगलियों Gyroscope - Italian: - Giroscopio di punta delle dita - Japanese: - 指先のジャイロスコープ - Korean: - 손가락 자이로스코프 - Malay: - Giroskop hujung jari - Norwegian Bokmål: - Fingertuppen gyroskop - Romanian: - Degetului giroscop - Russian: - Гироскоп пальца - Spanish: - Giroscopio de la yema del dedo - Thai: - ไจโรสโคปปลายนิ้ว - Turkish: - Parmak ucu jiroskop - Vietnamese: - Con quay hồi chuyển ngón tay.